Ed. Note: In light of the fact that many of our readers are not only involved in the finishing operations of the plant but also in plant design and maintenance, Surface Finishing.com is planning to run features addressing these issues. The following is an account of Bayer AG's use of PlantWise software to create detailed plant models for a new methyl chloride project. According to Olav Strom of Design Power, Inc., manufacturer of PlantWise, this software can also be used in metal finishing facilities. Using a front-end three-dimensional (3D) design tool created specifically for plant concept design, Bayer AG (Leverkusen, Germany) dramatically reduced the cost and time of developing a $36 million methyl chloride project. Using the PlantWise suite from Design Power, Inc. (Cupertino, CA), Bayer also enhanced its ability to optimize designs and improve plant efficiency by rapidly reconfiguring models to reflect changing plant parameters. 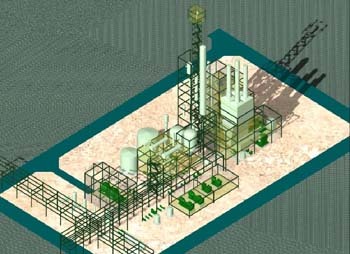 In testing the software on a methyl chloride plant already designed using with traditional computer-aided design (CAD) tools, Bayer found PlantWise helped them to reduce project costs by 4-10%, cut construction time 2-4 months, and cut in half the number of effort-hours needed to create 3D plant models. Additionally, by using PlantWise software, Bayer was able to reduce the time needed to create to create a 3D model of the full facility, which contains 80 pieces of equipment (but no pipelines) to seven effort-days, down from 90 effort-days. "The primary advantage of using PlantWise is the ease with which we can create and review new plant concepts in 3D," says Bayer Center for Technical Engineering project manager Thilo J. Werners. "The software allows managers to review and discuss design ideas and to implement alternative solutions on the fly. "For the methyl chloride plant, we considered numerous variations including piping and cable tray routing, operations concepts, erection and dismantling access for every piece of equipment, piping studies, instrumentation and control loops, penetrations and passages. PlantWise enabled the team to quickly develop and implement alternative solutions," says Werners. Bayer, an early adopter of three-dimensional (3D) plant design tools, has used Intergraph's (Huntsville, PA) Plant Design System (PDS) software since 1987. While such CAD software is well-suited for creating detailed plant models, engineers at Bayer's Center for Technical Engineering in Leverkusen learned through experience that CAD tools were inherently inefficient when it came to concept models and studies. These inefficiencies often resulted in costly change orders and rework. In 1997, using PlantWise (formerly PlantBuilder/AutoRouter), Bayer implemented a front-end plant design solution that enables the engineering group to create model studies in the early project phase. This eliminates a significant number of changes and rework. The software lets Bayer engineers optimize plant concepts using an "engineer-to-order" work process in which they generate detailed models and working drawings in PDS only after evaluating and costing designs in PlantWise. Bayer first used PlantWise for a DM65 million ($36 million) methyl chloride plant project that had already been designed using traditional CAD tools. It recreated a 3D model of the plant in PlantWise, then used the software to identify unacceptable interferences in the original design. Bayer estimates it saved approximately 4-10% of project costs and about 2-4 months in construction time by using PlantWise to identify changes to equipment, structural steel, and plant layout before the project proceeded. Collaboration. Individual modules designed for detailed design forced engineers and designers to create designs independently, without interdisciplinary collaboration, setting the stage for laborious interference checking. Specificity. CAD tools used for detailed design often require information not available at the front-end of a project, such as part catalogs, pressure drops and key values. Timeliness. Companies must complete detail design on a strict schedule determined by site preparation, equipment delivery, and construction schedules. Effective concept models simplify the process of generating detailed engineering data as needed. PlantWise is a knowledge-based design execution system developed specifically for front-end plant design. It automatically generates 3D plant models based on design rules and best practices based on imported piping and instrument diagrams (P&ID) and equipment data. Bayer has used the system since 1997 on a variety of new plant projects, creating conceptual models that optimize resources and provide a basis for detailed design. PlantWise models concrete and steel, place equipment, and routes piping in conceptual designs. The customizable software creates 3D models, material take-offs (MTOs), and piping cost estimates; checks interferences automatically; and generates plan view drawings. It enables engineers to rapidly evaluate the cost of multiple piping and plant layout alternatives early in the conceptual phase of the design process. This significantly shortens project schedules and increases the accuracy of cost estimates. PlantBuilder automatically generates 3D plant layouts from equipment information. Because PlantWise links to Bentley Systems Inc.'s (Exton, PA) MicroStation 3D CAD package, it lets both technical and nontechnical staff visualize alternative plant layouts. At Bayer, project managers, operators, production managers, and maintenance personnel review proposed layouts using PlantWise's 3D models to evaluate the impact of new designs on cost and usability. Bayer determined that on average, PlantWise cut the effort-hours to create a 3D plant model in half. On some projects, model generation savings were even higher. The company first used PlantWise to help design a new methyl chloride plant planned for Leverkusen. It had spent approximately 90 effort-days to build a 3D model of the facility using a conventional CAD tool. The model included steel structures and 80 pieces of equipment, but no pipelines. Using PlantWise, it recreated the 3D model in only seven effort-days. AutoRouter automatically routes piping to avoid obstacles while making the most efficient use of space. After defining the steel structure (which it had already sent to the fabricator) as fixed, it used PlantWise to evaluate the model for space utilization, operability, maintenance and safety. Bayer designers also used the software to automatically route the first 150 major process pipelines of the plant's 1100 pipes. PlantWise discovered unresolvable interferences in a variety of plant areas that indicated that the original concept could not be built as designed. Modifications to the plant concept produced changes to equipment, installation and even the steel structure. Without PlantWise, Bayer engineers would not have discovered the problems until the later stages of detail design or during construction. Early detection avoided costly rework and project delays. AutoRouter. AutoRouter routes piping to efficiently place connections and nozzles while avoiding surrounding structures, pipelines, equipment, and maintenance spaces. It automatically converts 2D information from piping and instrumentation diagrams (P&IDs) into 3D models. PlantBuilder. 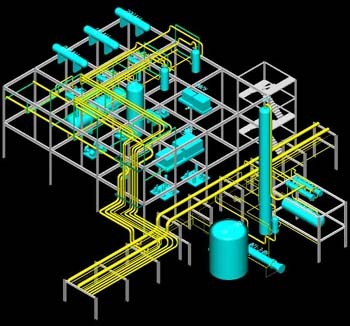 PlantBuilder automatically generates 3D plant layouts from equipment information. It uses customizable parametric equipment libraries and P&ID or PFD equipment data to rapidly generate models containing pipeways and structures. PlantDrafter. PlantDrafter automatically generates 2D drawings, such as plot plans, detached plans, and plant isometrics, directly from PlantBuilder and AutoRouter 3D models. For more information: Design Power, Inc., 10020 N. De Anza Blvd., Cupertino, CA 95014. Phone: 408-366-6600. Fax: 408-366-6607.